During the uprisings and thereafter, we lost hundreds of Tibetan women in the brutal crackdown enforced by the Chinese forces. We hail them as martyrs who sacrificed their lives for the cause of Tibet. The Tibetan Women’s Association, which was initially established in Lhasa on 12th March 1959, was reinstated in India on 10th September 1984. The core purpose of establishing this association is to continue the works of all the great women of Tibet, who have sacrificed themselves to preserve our identity, freedom and our culture. We pledge that the hardships endured by these martyrs for the cause will not go in vain and that we will continue to stand resolutely united and be of firm commitment the to the cause of Tibet. We also revere all women who made great efforts and sacrifices during the hardest period of early years in exile. Today, the situation inside Tibet is faced with intensification of crackdown and systematic repression on Tibetan people. The results are evident in the spate of self-immolations that persists. Since 2009, 127 Tibetans in Tibet including 19 women have set themselves alight calling for the return of His Holiness the XIVth Dalai Lama to Tibet and freedom for Tibetans. In exile, since 1998, six Tibetans have self-immolated to protest against the callous crackdowns inside Tibet. We stand in solidarity with all the supreme sacrifices made by these martyrs. Today in Tibet, any expression of identity and patriotism is dealt with in the most severe manner. The arbitrary arrests and sentencing of Tibetan singers, writers and social activists, who work for the welfare of all the Tibetans, have increased over the years. The Chinese authorities also continue to criminalize the family members, friends and relatives of these self-immolators by calling them as murderers or inciters. In august last year, the intermediate court in Ngaba region, meted out death sentence to Dolma Kyab, husband of Kunchok Wangmo who self-immolated on 13th March 13 last year. The court charged Dolma kyab for murder of his wife. In December 2013, Geshe Ngawang Jamyang, a senior Tibetan monk from Diru was beaten to death by Chinese police. In January this year, Kunchok Dakpa, a young Tibetan man was beaten to death. He was arrested for his participation in May 2013 protest against mining in Diru in May 2013. These incidences bring to light the harrowing human rights situation inside Tibet. TWA remain gravely concerned about the continued abduction of the XIth Panchen Lama, Gendun Choekyi Nyima who will turn 25 years old this year. The imprisonment of Tulku Tenzin Delek despite his ailing condition is worrisome. TWA calls on the Chinese leadership to acknowledge their 60 years of failed policies in Tibet that has proven to be catastrophic and review their policies and deal sensibly with the Tibet challenge. TWA’s steadfast commitment to resolving the long-standing issue of Tibet through the Middle Way Policy seeking genuine autonomy for Tibet, remain strong. In this light, TWA has sent appeal letters and substantial reports to the concerned UN bodies and other world governments to urge the Chinese government to resolve Tibet’s issue through dialogue and non-violence. TWA respects His Holiness the Dalai Lama as the spiritual leader of Tibetans inside and outside Tibet and as the global ambassador of peace and compassion. We abhor the Chinese government’s hurling of abuses against His Holiness and the ruthless warnings issued by the Chinese leadership to the world leaders refraining them from meeting with His Holiness. We also received response letter from the Indian Nursing Council for our appeal to the council to reconsider and reassess the resolution passed as per the letter dated 25th March, 2013 titled ‘Equivalency-Foreign Nationals’. 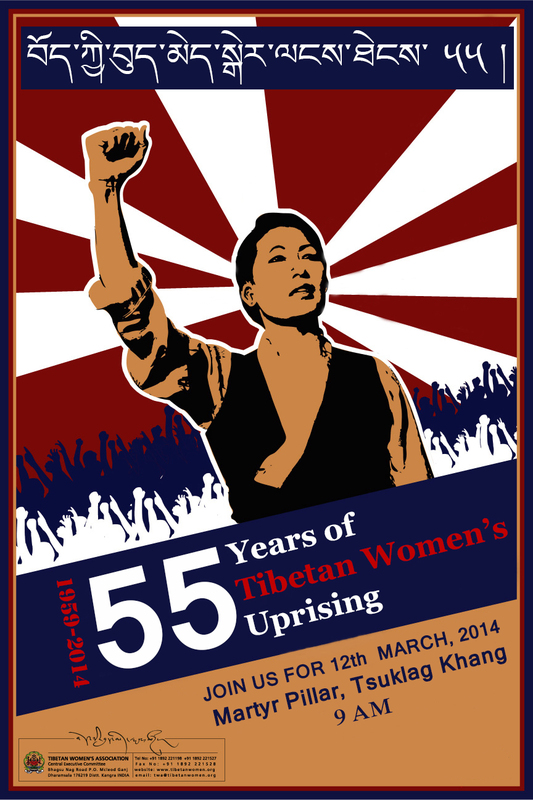 TWA dedicates this 55th anniversary to the women inside Tibet. This year, TWA announces a fellowship program for young women in Tibet pursuing professional studies. The fellowship will be imparted to the target group through a reliable international foundation. Despite the draconian policies of the Chinese government to weaken the use of Tibetan language, Tibetans inside Tibet have been taking creative and sustained efforts to preserve and promote Tibetan language, culture and identity. This inspires Tibetans in exile to follow suit. In a bid to laud their efforts, this year TWA announces two informal researchers’ seats (in Tibetan language) for two Tibetan women in exile. The research topics are ‘Intermarriage between Tibetans and Chinese under China’s rule in Tibet’ and ‘Intermarriage between Tibetans and foreigners in exile’. The details will be made available on TWA’s website after April 1 this year. In exile, in honor of the 19 Tibetan women who died of self-immolation protests, TWA announces an honorary award of 25,000 INR to Tsering Dolkar, also known as ‘Tibetan Mother Teresa,’ for her work for humanity and the haggard. TWA believes that the Tibetan struggle is not only a political struggle of the Tibetan people against the Chinese Communist regime, but also essentially a struggle against injustices that bears moral weight on the international community to respond to travesty of justice taking place at an unprecedented stage, thus stirring the human conscience. Beginning March 12, TWA launched an online petition addressed to Navanethem Pillay, the United Nations High Commissioner for Human Rights (OHCHR) and Herman Van Rompuy, president of the European Council. The petition urges governments and people of the world to urge China’s government to response to the negotiation extended by the representatives of the His Holiness the Dalai Lama. Today, Tibetan women across the globe commemorate this day by offering offer our deepest respect to human rights defenders across the globe. We pledge to dedicate ourselves to work for human rights, peace, and freedom in Tibet and the other regions of the world where peace is held hostage by brutal regimes. This is a request of TWA to the older generation to educate the younger generation about the values that exist in our culture and the younger generation must know and practice the essence of our unique culture. Tibetans in exile should not fail to preserve and promote our culture and tradition while we are struggling for a better livelihood. People inside Tibet endeavor to preserve the culture even under the duress of occupation. With firm affirmation of our faith in the leadership of His Holiness the Dalai Lama, we pray for his long life. May all the Tibetans be soon united in Tibet.